Professional development session for second-year Master of Public Policy students. Guest speakers provided an overview of AMCTO’s work, as well as advice and guidance to students on how to prepare for the job market in the municipal sector. Training workshop to prepare Master of Public Policy and Master of Global Affairs students to explore and report on key issues and concerns in each of the 25 new wards as part of the Urban Policy Lab's "Munk in the City" initiative. Panel discussion connecting students with several candidates in the upcoming Toronto election who are challenging long-time incumbents, particularly new voices who are running to challenge the status quo at City Hall. The Observatory, main floor library/gallery, 315 Bloor St. W.
To celebrate the efforts of our MGA and MPP participants involved in the "Munk in the City" initiative, the Munk School will host an election night viewing party where students will have the opportunity to showcase their work while enjoying the company of friends and colleagues as poll results come in. 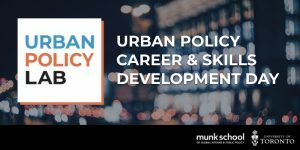 As part of the Munk School's MPP Professional Development week, the Urban Policy Lab has organized multiple interactive panels and small-group workshops to help MPP students gain specialized skills and knowledge relevant for a career in urban policy at all three levels of government. Munk 108N and 208N at 1 Devonshire Pl. 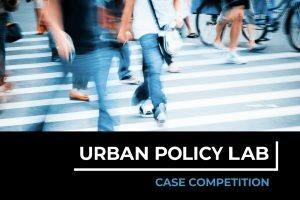 The Urban Policy Lab Case Competition is a student-led competition, organized by the Lab's Graduate Fellows, that challenges MPP and MGA students to work together to solve some of the toughest issues facing cities.